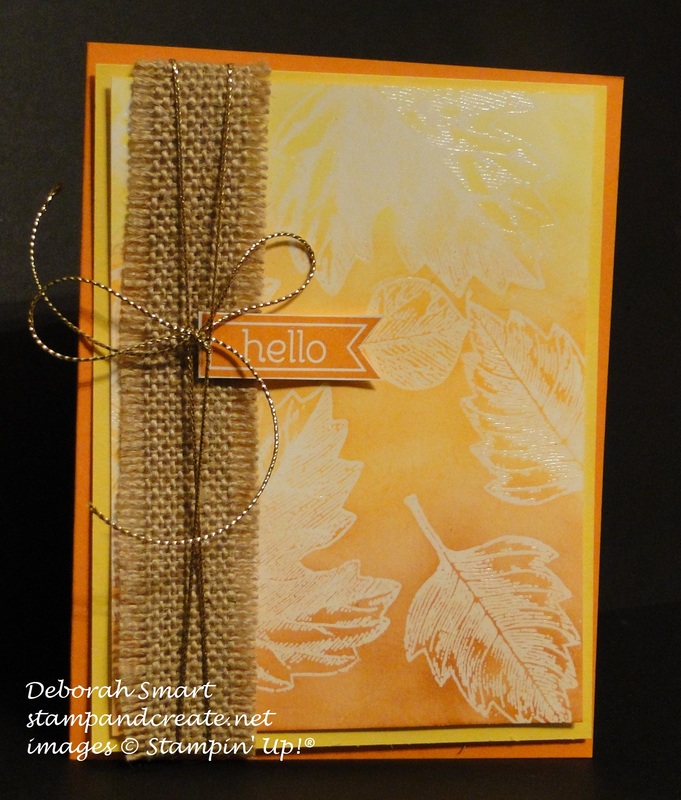 Creation Station Blog Tour – Fall Fun! To refresh your memory (or to let you know, in case this is your first time joining us), our hop goes in a circular fashion; each blog is ‘linked’ to the one before and after it, so as long as you keep traveling in one direction, you’ll be taken through all of the participating blogs, and see all of the creative inspiration we have for you today! It’s a small hop this time around – only 4 of us – so you won’t want to miss a thing! This card uses the wonderful Hearth & Home Thinlits Die, and the Happy Scenes stamp set. First I stamped the fall scene from the Happy Scenes stamp set in Tip Top Taupe ink, then used my Blender Pen and Pumpkin Pie, So Saffron, Mossy Meadow & Old Olive inks to colour in the images and lightly colour in the grass. 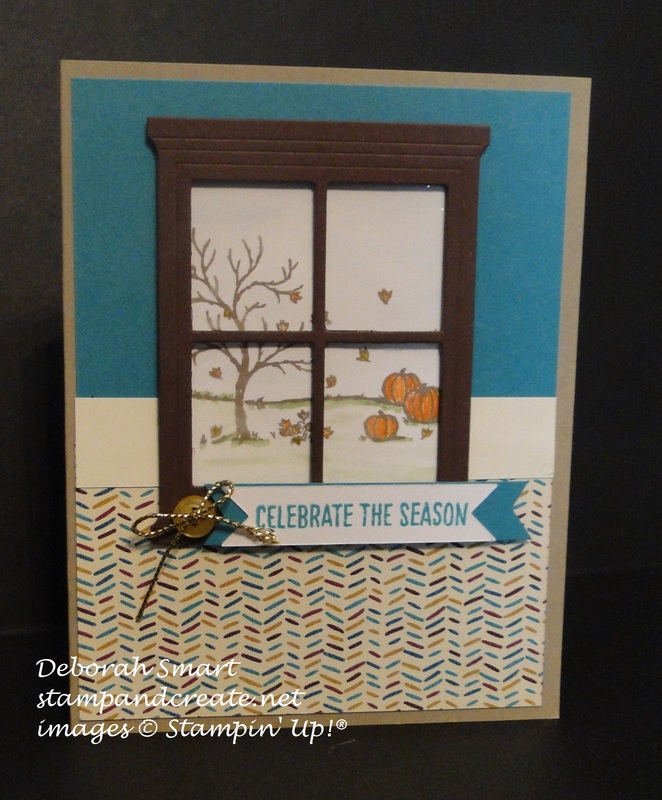 The window frame was die cut in Chocolate Chip cardstock using the Big Shot and the Hearth & Home Thinlits Dies. The sentiment, from the Happy Scenes set, was stamped on Whisper White cardstock in Bermuda Bay ink. The card base is Crumb Cake cardstock, with a panel of Bermuda Bay cardstock and Bohemian Designer Series Paper, with a strip of Very Vanilla cardstock across the centre, to mimic a chair rail on a wall. The card was finished off with a small button, tied with the new Gold Cording Trim. This fun stamp set is called Among the Branches, and can be bundled with the Woodland embossing folder. This time, however, I decided to pair it with the Brick Wall embossing folder, as I had something in mind to try out. I embossed the panel of Cajun Craze cardstock using the Brick embossing folder, then distressed it a bit by using a Sponge Dauber and Smoky Slate and Crumb Cake inks. I then tore a few holes in the bricks – this is an old brick wall! I stamped the branches, leaves, crow and owl silhouettes onto Whisper White cardstock, cut them out and glued the onto the brick panel. Before attaching the brick panel to the Basic Black cardstock, I stamped the spooky eyes in Versamark ink onto the Basic Black cardstock, and heat embossed them with Clear embossing powder. In this close-up picture, you can see the eyes ‘glowing’ from between the bricks! I stamped the sentiment in Crushed Curry ink onto Whisper White cardstock, and used the 2″ Circle Punch to punch it out. I then sponged around the edge with Crushed Curry ink and a Sponge Dauber, and attached it to the card front. I then attached the card front onto the card base, made of Cajun Craze cardstock. For my final card, I used an old favourite technique; emboss resist. First I stamped the leaves from the Vintage Leaves stamp set in Versamark ink onto Whisper White cardstock, covered them with Clear embossing powder, and heat set it. 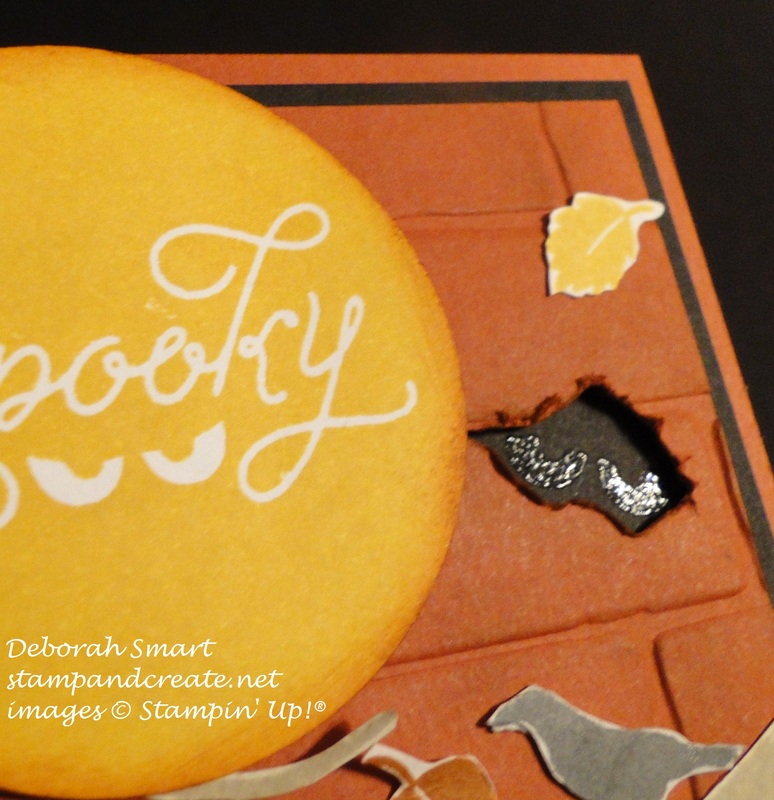 I then created an ombre effect using Daffodil Delight, Pumpkin Pie and Cajun Craze inks and Sponge Daubers. Because the leaf images are embossed, they resist picking up the ink colours; a quick wipe with a paper towel removes any ink that is sitting on top of the embossing. I layered the image panel onto a panel of Daffodil Delight cardstock, then wrapped a piece of Burlap Ribbon along the left side; first removing the stitching from both sides, and fraying it a bit. I then would the Gold Cording Trim around the Burlap Ribbon 2 times, and tied it off in a bow. 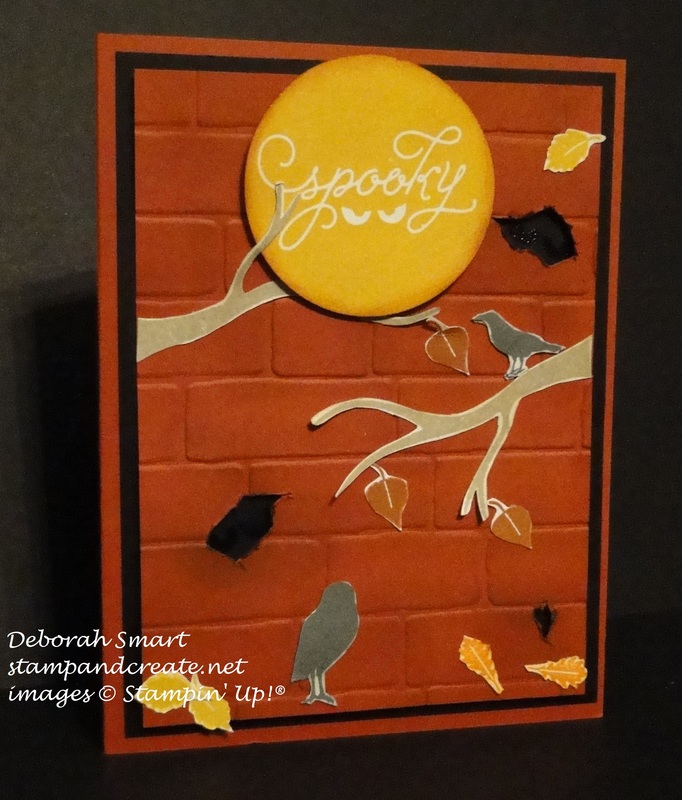 The whole front panel was then attached to a card base of Pumpkin Pie cardstock. That’s it for my projects; if you have time, I’d love to read a message from you! Now you can head back to the beginning of the hop to Kathy Kartak’s blog by clicking on the ‘next’ button, or go back and have another look at Dena’s fabulous work by clicking on the ‘back’ button. Thanks for spending some time with us today – until next time; happy stamping! Previous Previous post: Wacky Watercooler Blog Hop – September Mix-it-Up! Oh My gosh!!!! The eyes behind the wall!!! Soooo clever!! Love all your projects!! Thanks, Dena! I always remember being spooked by glowing eyes when I was a kid!